Shoals extending out ten miles into the Atlantic make this area around Cape Lookout extremely hazardous to shipping especially in the early days of sail and steam. It was nicknamed the “Horrible Headland” by many mariners and a necessary place for a lighthouse. The first lighthouse at this site was built in 1912 and was quite different than other lighthouses of the day. It had an inner tower built of brick with an outer shell constructed of wood. It rose to a height of 104 feet but its light was not very effective and seamen often complained about it. It was replaced in 1859 with the current lighthouse rising 150 feet high and crowned with a first-order Fresnel lens. During the Civil War the Confederates badly damaged the lens and a third-order lens was put in its place. After the war the first-order lens was repaired and is back and operating to this day. The wooden staircase up the lighthouse was used only four years when it was replaced with a metal one to lessen the fire hazard. 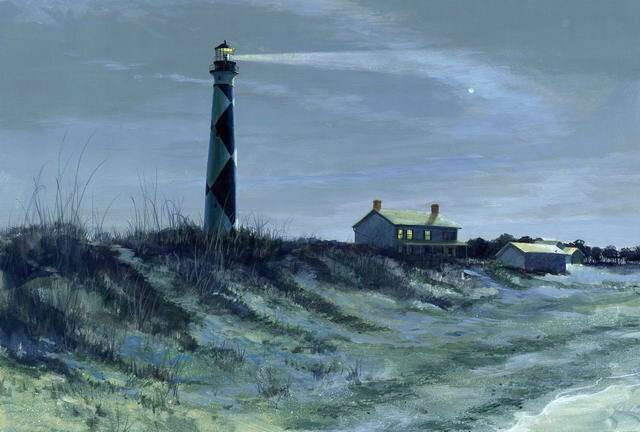 Erosion is always a threat to lighthouses and the Cape Lookout lighthouse hasn’t escaped mother natures plans. It’s been a little different here however, as it is not the Atlantic side of the island that is disappearing. In fact the ocean side has actually built up over past years. It’s the inlet side, nearer to the lighthouse that is loosing ground. The channel and tidal currents have cut almost a thousand feet of beach from in front of the lighthouse in recent years. The keepers house now stands only about twenty feet from the high tide mark. In order to help save what is left of the beach, an old channel was dredged and reopened diverting much of the water flow to other areas and somewhat reduced the risk of further erosion to the beach. The lighthouse doesn’t have many trees or vegetation around it like so many other lighthouses I have visited so the full impact of its size and strength can be realized when looking at it from most any angle. Being an old sign painter, I wondered how they drew those large black and white diamond patterns on the lighthouse but it occurred to me that they are just two opposing spirals that intersect each other. I haven’t found out how they first actually layout the spiral pattern to paint but it appears that the painter would perhaps measure down eight bricks and over four and strike a point. That would give him an angle to draw a straight line. He would then repeat the same procedure all the way down. The spirals appear to be at forty-five degree angles, so if a brick is twice as long as it is high then that formula would be about right. The diamond pattern was painted on the tower in 1873 to increase its effectiveness as a daymark and the nearby town of Diamond City got its name because of the lighthouse pattern. You won’t be driving your car to Cape Lookout but several ferry services that run from Harkers Island will take you there for a small fee.